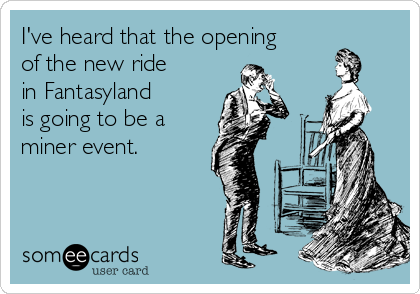 The wait is almost over for the opening of the Seven Dwarfs Mine Train in Fantasyland. This long anticipated ride experience will be open to the public on May 28th, per Tom Staggs, the Chairman of Disney Parks and Resorts. The Magic Kingdom hosted a media preview yesterday to dedicate the ride and give the press an opportunity to enjoy the latest attraction. Theme Park Review posted a point of view video (POV) to YouTube and it is outstanding! Click here to go to YouTube to watch their video and listen to the commentary on the second ride through. Heigh Ho…Heigh Ho…Heigh Ho…Heigh Ho! This entry was posted in Uncategorized and tagged Seven Dwarfs Mine Train Opening Day, Seven Dwarfs Mine Train. Opening. Bookmark the permalink. ← Brrrrr…Is It Getting Colder In Here?